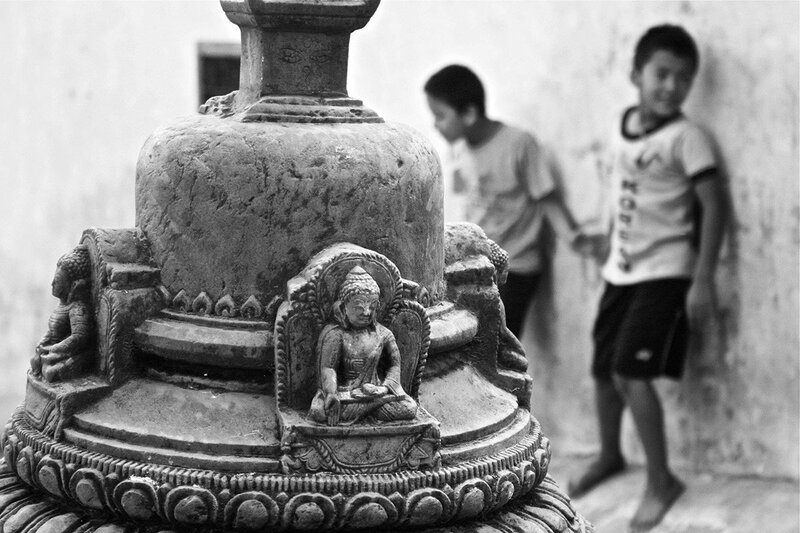 Children playing at Swayambhu. All photos by Jyoti Upadhyay. Earlier this year, when we met designer Jyoti Upadhyay and had a chance to see her intricate Himalayan-made jewelry line, we knew we had to find out more. Raised in Wales, Upadhyay has since moved to her ancestral country, where she resides in Nepal's capital. We asked her for a list of essential things to do and see in Kathmandu. KATHMANDU, Nepal - I've been in Kathmandu for seven years; before Nepal, I lived in London, Nairobi, Uganda, and Wales. My Nepali parents migrated to Wales in the '70s, so that's where I grew up. Childhood summers were in Eastern Nepal and Northeast India, chasing dragonflies on the roof, climbing guava trees, and inevitably being stuffed with food by relatives under the scorching sun. I moved to Nepal in my 20s, with vague ideas of starting a social enterprise one day far in the future. Autumn is my absolute favorite time of year in Kathmandu Valley, which is actually a conglomeration of three medieval city-states — Kathmandu, Patan, and Bhaktapur. The monsoon season just ended. The weather is dry and sunny, but mornings and evenings are cool. The season is packed with cultural events like and , as well as traditional festivals like Dasain, Tihar, and Chhath, so it's a time to reconnect with extended family. There's so much happening in the city, but it's also a perfect time to be out in the mountains, as the views of the Himalayas are crystal clear. This is my list of essentials for anyone planning a visit to Kathmandu. The city's medieval quarter was part of the ancient trade route between India and Tibet. Today it's home to our central vegetable and spice market, lanes of copper and brass vessels, fabric shops, and jewelry makers. Go for the fragrant spices, soft yak wool blankets, and the most beautiful pink and black Himalayan rock salt. 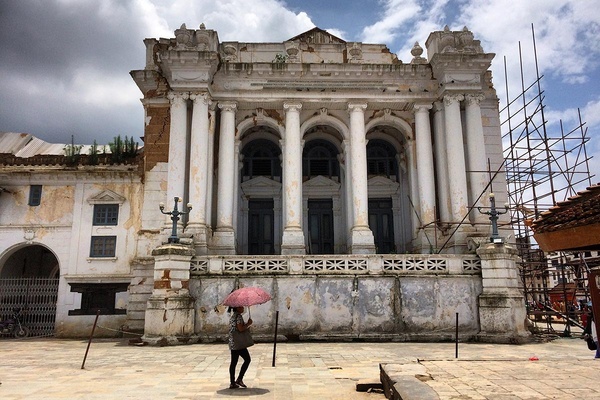 Wander to the tourist quarter of Thamel; pick up a copy of Thamel, Dark Star of Kathmandu (Rabi Thapa, 2016) to get a sense of Nepal's breakneck pace of change over the last half-century. After years of restoration, the 18th-century palace reopened in the '90s as a world-class museum. It houses some of the finest examples of Newari art, including cast bronze sculptures and exquisite repoussé (metal) work. Several of the city's artistic events are centered around the museum and Kathmandu Durbar Square. The square is a UNESCO World Heritage site, but unlike protected areas I've visited in other parts of the world, it's brimming with local life. One of my favorite memories is cycling past on a moonlit night and having the place all to myself — aside from a street dog or three. Two very different gallery spaces located close to each other: One is a nondescript concrete building and the other is set in what used to be the stables of a glorious Rana palace built in 1908. It now houses the government. Exhibitions can be hit or miss, so check to see what's on. 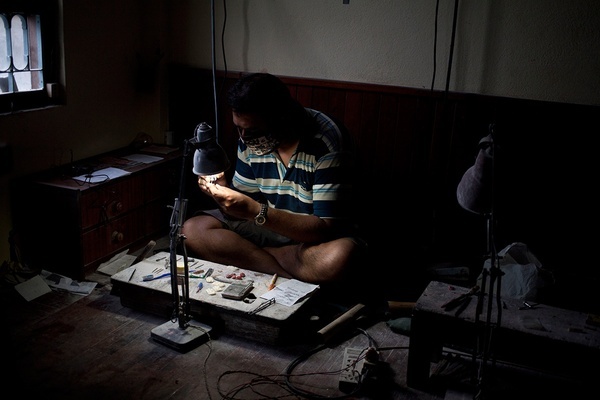 A gem carver at work in Patan. Monsoon skies over Kathmandu Dubar Square. A very laid-back, social coffee shop that lets you pay what you want. It's your karma, after all. The coffee is grown, roasted, and ground in Nepal, and they occasionally have wonderful small-batch speciality teas. An independent cafe that is as charming as its owner. It's tucked away on a leafy residential street next to the American Embassy. It's popular with Nepalis and expats alike, but it is off the beaten trail for tourists. Go for the best burgers and homemade cakes in the country. The Buddhist stupa is the heart of the exiled Tibetan community in Nepal and a hugely spiritual place. Best to arrive just before dusk. After walking around the Buddhist shrine, pick a rooftop cafe and watch devotees circumambulate the stupa seven times — a practice called kora. I particularly love how the white-washed dome looks against the moody monsoon sky. If it's winter, find your way to Double Dorje for momos (dumplings) and tongba, a warm millet brew. The service is slow and quirky, but the elderly proprietress will win you over with her grin. Like everything else in Nepal, Boudha is particularly special on full moon evenings, when the place is filled with people lighting butter lamps. Managed by three generations of the Shrestha family (and their dogs), the atmosphere is divine with a dash of homely. The hotel was built to house restored woodcarvings that date as far back as the 13th century. If you can't spend the night, at least visit for dinner in the or at . 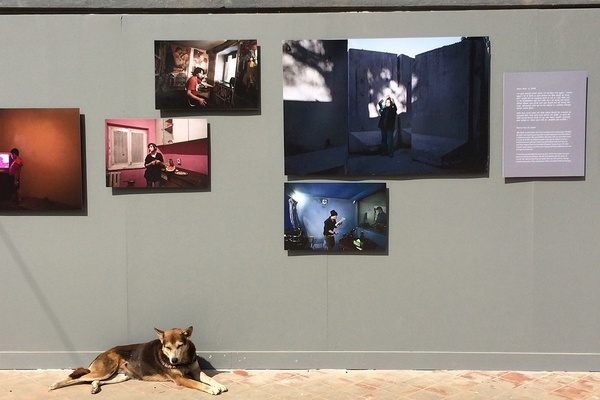 An interactive, international photo festival that takes place in the lanes, courtyards, and public spaces of Patan. Organized by a group called , the festival just wrapped up its second year, but is a definite highlight on the cultural calendar. Set on a hillock not far from Thamel, you'll find incredible views of the crazy conurbation that is Kathmandu from the historical Buddhist and Hindu temple. Go early in the morning when locals are powering or puffing their way up the steps on their morning walk, and during Gunla, a month-long Newar festival. Do not feed the monkeys! A local taking in a PhotoKTM exhibit. Dwarika's Hotel courtyard. Photo courtesy of Dwarika's Hotel. Kirtipur is half an hour from Patan by bus, and despite its chaotic urban development, still retains an old-town feel in the lanes leading up to this traditional restaurant run by women of the local Newar community. I tend to pass on the fried lungs and tongue (local delicacies), but devour the cooked beans and spiced potatoes. The main reason to go is the rice beer, home-brewed, of course. If you're lucky they'll have thick millet beer, which is even tastier, but a meal unto itself. 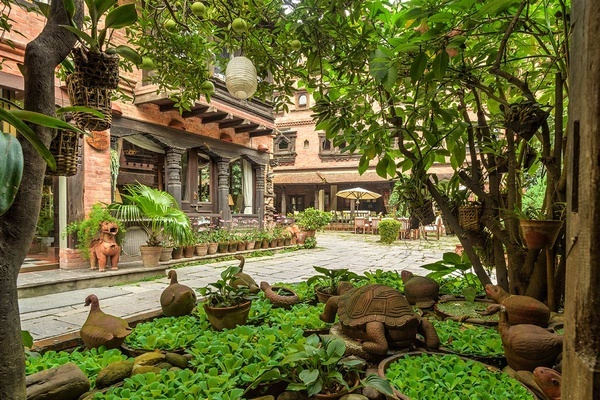 The younger sibling of Dwarika's Hotel is a holistic retreat, though it works just as well as a regular treat at the end of a visit to Nepal. The resort is small and the level of care is very special. The food, sourced from the resort's own farm, and delicately prepared by Chef Pramod, is a highlight. The sunrise and sunset views of the Himalayas, when the clouds comply, are sublime. It's not cheap, but you'll see why. The hike is manageable in a day from Kathmandu or Dhulikhel. Start at Bhatte Danda and walk along the ridge and up through the forest to the impressive Namobuddha Monastery, taking in the views of the valleys below and the Himalayas beyond. Stroll down to the valley floor, past paddy fields and small settlements, to the very picturesque town of Panauti. Inspired by the history, geography, and diversity of the Himalayan region, Upadhyay works with local artists to showcase traditional Nepali styles and techniques in . Jyoti is a designer, craft buff, and the founder of , a jewelry and furniture line handcrafted in the Himalayas. You can follow her on . She travels for the chance to discover independent artisans and the wonder that the mountains always elicit.